Carol receives nutritious food at one of the Food Bank’s partner agencies. Food insecurity impacts Los Angeles County differently than most people realize. 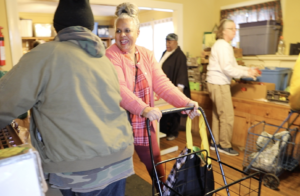 In 2018, 18 percent of the food distributed by the Food Bank and its Partner Agency Network went to older adults who struggle with hunger. In California, one out of five residents over 65 years of age currently struggles with food insecurity and Los Angeles has been especially hard hit. The city is home to the largest estimated population of food insecure seniors in the country. Too often, we hear stories about older adults who have to make tough choices when it comes to spending. After paying rent, utilities and medical bills there isn’t a lot of money left over for food, let alone fresh, nutritious food.